Are you ready to get in on the action at Lucky Dog Casino Night? We’re so excited to invite you to Lucky Dog Casino Night on November 22 at the Sheraton Harrisburg Hershey! We had so much fun at last year’s event, and this year should be even better! The evening begins at 6 p.m. with a reception, dinner, and silent and live auctions. This year, we have some great silent auction items for you, donated by our supporters. We have items from Climbnasium, Naylor Wine Cellars, Dog Is Good, Hill’s Pet Nutritio, Bold Lead Designs, and Pizza Grill, among many others. Service dogs and service dogs in training are welcome, of course, but we ask that you leave your pets at home. Tickets are available online. We hope to see you there! Yesterday in Team Training, our partners ate lunch with their dogs for the first time, and next week, they’ll be eating in a restaurant for the first time. People with service dogs have public access, which means they can take their dog anywhere that’s open to the public. This includes restaurants, which as you well know, normally do not allow dogs. 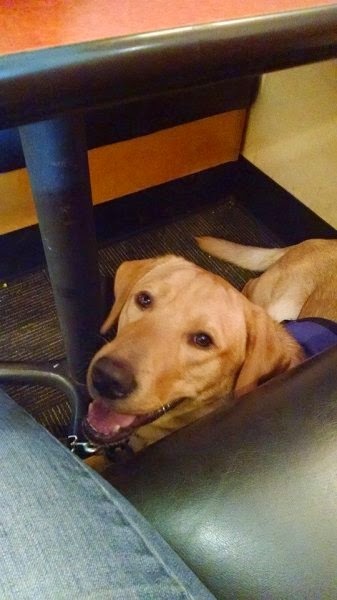 Here are some tips for taking your service dog or service dog in training to a restaurant. While you’re in the restaurant, your dog is going to be tucked under the table in a long down-stay. Ideally, your dog will fall asleep. When you’re choosing a table in a restaurant, keep your dog’s comfort in mind. If a table has one leg in the center, your dog may not be able to lie comfortably under the table, which means she’ll be less likely to remain in a down-stay while you’re eating. If you’re being seated by a hostess, don’t hesitate to request a booth if you see that your dog won’t fit comfortably under the other tables. When you’re walking into the restaurant and going to your table, be mindful of the other patrons. Don’t let your dog sniff other people. If the restaurant seems like a challenging place for your dog, you can hold a few treats in front of your dog’s nose to keep them focused until you get to your table. The same goes when it’s time to leave. If your dog has been lying down for a long time, the first thing they’re going to do when they stand up is shake themselves. Try to have your dog stand where they won’t send fur flying in all directions. For example, if you’re at a booth, ask your dog to stand while they’re still tucked under the table. Inevitably, food ends up on the floor in restaurants. And chances are high that if there’s food on the floor, your dog will find it. Keep an eye out for anything on the floor that might distract your dog. But what if you want to go to a restaurant that offers things like peanuts to patrons and encourages people to throw the shells on the floor? This might be a good time to simply leave your dog at home. Buffets can be very tricky to navigate with a dog. You have to hold the leash, serve yourself food, and carry your plate. It can be a balancing act! You can always leave your dog at the table with a friend or family member and ask them to hold your dog’s leash while you get your food. If you take your dog through the buffet line, keep a close watch on your dog because you don’t want them sniffing at the table or stealing a lick or a piece of food. As you move through the line, you can put your dog in a “down” while you serve yourself. This will keep your dog’s nose far away from the food. Then you’ll just need to balance your plate and hold your dog’s leash as you walk back to your table. If your table is near the buffet and you know your dog has a solid down-stay, it can be very tempting to leave your dog unattended at the table while you get your food. However, while you might know your dog extremely well, you don’t know the other people in the restaurant. While you’re at the buffet, a child (or an adult) could pet your dog under the table, they could try to feed your dog, or someone could whistle or talk to your dog, all of which could easily distract him. It’s always best for you or someone you trust to stay with your dog at all times in a restaurant. 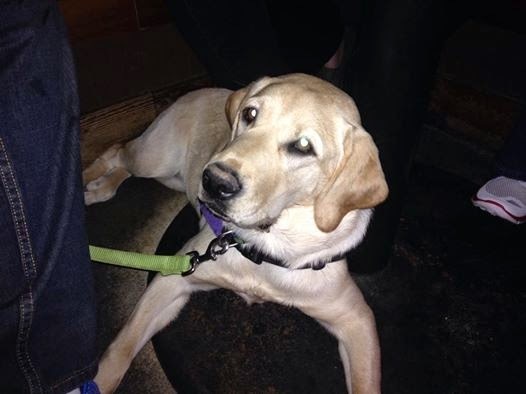 Have you taken your service dog or service dog in training to a restaurant? Share your tips in the comments. After spending about 18 months with their puppy raisers and another 6-8 months in advanced training with our professional trainers, SSD Cobalt, SSD Kingston, SSD London, and SSD Outback are ready to work. These four dogs have been working with their new partners in Team Training since Monday. During the first day of Team Training, we spent the morning talking about the process of Team Training and Susquehanna Service Dogs and learning about clicker training and shaping (our training methods). And then after lunch came the moment everyone was waiting for. It was the moment when each person gets their dog for the first time. It’s one of our favorite parts of Team Training. Our volunteers and trainers brought the dogs in one at a time. As the dogs came in, they made a beeline for their partners, and their tails were wagging so fast they were just a blur. Watch how happy Kingston is to greet his new partner. To help the dogs learn exactly who they need to pay attention to, we had each person give their dog lots of treats during this first meeting. After each team had a chance to start bonding, we began working on basic cues, such as the dog’s name, sit, down, and come. For the first week of Team Training, our teams learn several new cues each day. We also practice behaviors like getting in and out of a car, using an elevator, going to a restaurant, and handling greetings with all kinds of people. Today is such a beautiful day that we spent most of the morning outside. Each team worked on loose leash walking through the grass and then went through several cues, including sit, down, stand, and pressure (the dog lays across the person’s legs), and up. Today is also the first time that each person ate lunch with their dog. To get ready, we practiced the cue “under,” where the dogs go under the table and lay down. Over the next week and a half, our service dog teams in training will take their new skills out in public. We’ll visit the local malls and have lunch in restaurants and food courts, and by the end of the two and a half weeks, each person will be well prepared to take their public access test with their service dog. Each team is doing great! We're looking forward to the rest of Team Training! 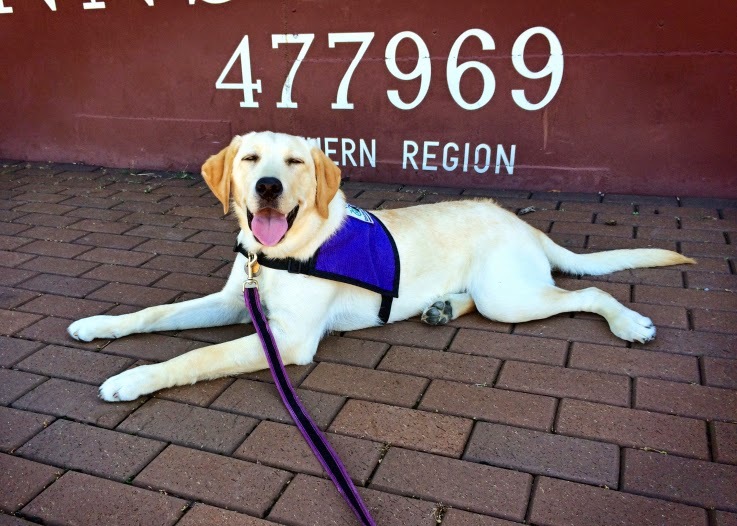 All of our puppy raisers teach their service dogs in training 26 behaviors. However, there are a few that we consider “gold star” behaviors. These are the behaviors that we would love for all of our dogs to know by the time they come to the kennel for advanced training. These gold star behaviors are “lap,” “visit,” “heel,” “back,” and loose leash walking. Right now, all of our puppies in training are working on “heel” in puppy class. When the behavior is finished, the dog should swing his hind legs around until he’s standing parallel against his handler’s left side. We have a very specific way of training “heel.” All of our dogs start learning the behavior on a heel box, which is a one foot square box about six inches high. The dogs put their front feet on the box, which then acts as an anchor for the dog’s front paws while they learn to move their back legs counter clockwise. Once the dog puts his front paws on the box, the handler starts stepping counter clockwise around the box, clicking and treating the dog for moving their hind legs. Gradually, we hold the click until the dog has taken several steps. Eventually, the dog will pivot the entire way around the box until they’re in the heel position at their handler’s left side. Watch SSD Laura move her back legs all the way around the box. Note that at this point, we’re not using any cues. The behavior isn’t finished yet. Now we take the box away and start the process all over again with a board or piece of paper on the floor instead of the box. SSD Laura’s puppy raisers used a square board. Watch how Laura continues to move her back legs around the board. Finally, it’s time to remove the board or paper. At this point we can add the cue “heel,” if the dog is moving into the heel position consistently. Look at how Laura snaps into the heel position regardless of how her puppy raiser moves. As you’ve probably guessed, it takes time for the dogs to learn “heel,” since there are so many steps. Dogs that come into advanced training already knowing “heel” will be able to start learning other behaviors sooner than dogs that still need to work on the behavior. We’ve seen lots of dogs in puppy class who are on their way to finishing this gold star behavior! 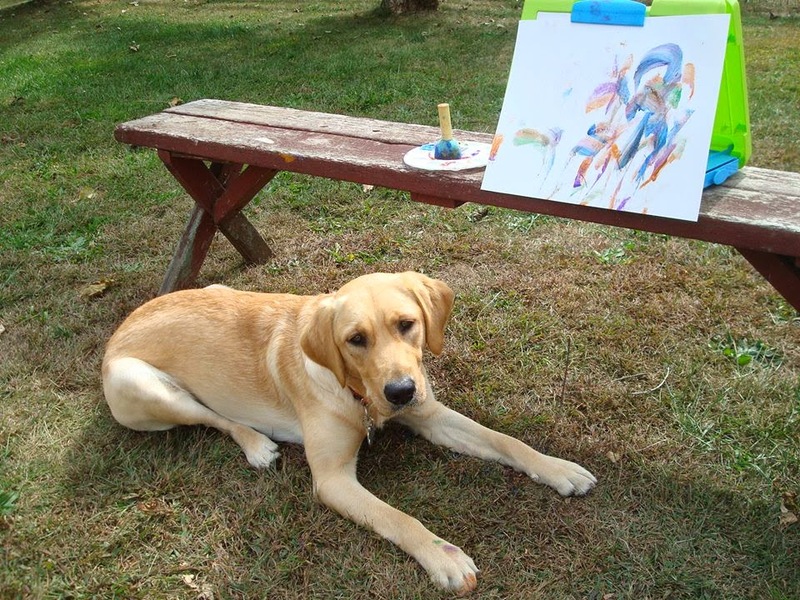 Creative Behavior Challenge: Can Dogs Paint? We have some budding artists in our Northeast Puppy Raising Program, and they all have four paws. 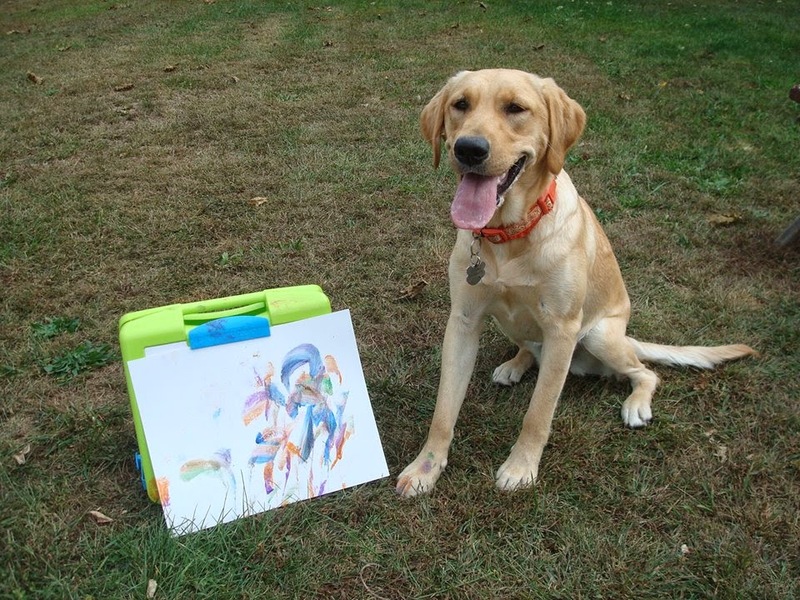 SSD Olympia and the other service dogs in training in our Northeast group are learning how to draw and paint, and it’s all part of their service dog training. Our Northeast Puppy Raising Program has been meeting in Wilkes-Barre on Wednesday evenings for over six years. Classes are taught by Meg Irizarry, who has been a force-free dog trainer for more than two decades. She provides guidance and shares her knowledge and expertise with our puppy raisers. The Northeast group goes on many outings to places like mini-golf, the movies, a dairy farm, grocery stores, casinos, and even bowling. They also make a yearly outing to the airport, where the service dogs in training experience airport security. Every year for fun and to improve the raisers’ training skills, Meg assigns a Creative Behavior Challenge. For this challenge, the raisers need to devise their own training plans and present the finished multi-step behaviors to the class. Skilled service dogs must be able to perform multi-step tasks, so we teach them how to “chain” behaviors together. Deb taught SSD Zane to put a cone on a puddle of spilled water to make sure no one slipped and got hurt. SSD Graham learned how to put plastic rings on a cone, thanks to Sarah K. Knowing Graham, he probably keeps his toy box organized, too. Another year, Meg asked the raisers to choreograph a canine freestyle dance routine. SSD Nubble danced to “I Can See Clearly Now” with raisers Donna and Lindsey. Nubble was definitely the best dancer of the three, mostly because he is so adorable. Last year’s challenge involved a secret phrase for each pup. Each raiser taught their dog a task demonstrating the phrase. The class then tried to guess the phrase based on the task performed. Sarah and SSD McKinley’s phrase was “tragedy/comedy.” McKinley “played dead” and then jumped up at the last minute to make everyone laugh. Donna’s phrase was “in/out,” so she taught SSD Roo to ring a doorbell to enter the classroom. After the challenge, this skill came in handy at home. Roo would ring a doorbell installed at nose height for permission to come inside. This was more pleasant than barking to be let in. This year, we have our canine artists. In the spring, Meg handed out non-toxic markers and paper. The task was “Drawing for Dogs 101.” To accomplish this challenge with SSD Olympia, Donna devised a series of steps. First, Olympia targeted (touched) the paper with her nose. Then she targeted the paper with the marker in her mouth. Donna’s plan was to have Olympia draw a triangle, but Olympia gets very excited while training and consequently drew in a more abstract style. Donna also found that Olympia tended to water down the markers with her saliva, so she decided to teach her how to use paint. This required additional steps to target the paint palette, as well as some experimentation to find the best painting tool. A sponge brush ended up working best. Olympia continues to enjoy creating works of art and her raiser says that Olympia hopes to cushion her retirement savings with the proceeds from her paintings! What do you think of Olympia’s masterpieces? All the raisers in the Northeast group are looking forward to next year, when Meg will surely ask them to rise to the challenge again.